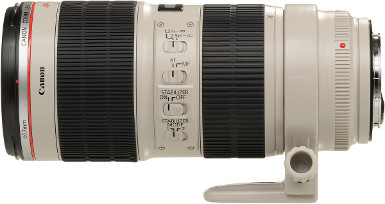 This telephoto lens has focal range of 70 - 200 mm and maximum aperture of f/2.8. User can use this lens with any camera compatible with Canon EF mount. Weighing 1,490 g, the lens has dimensions of 88.8 x 199 mm. The Canon lens has maximum magnification of 0.21x and can optically zoom up to 2.9x. The filter attachment size of the lens is 77 mm.